This part consumer-focused primer and part textbook is meant to be a starting point for dialogue around data (this which is the currency on which digital is built) and creativity (that which is the last of things that make us human) and how it applies in marketing (including AI and machine learning). But you know me – I’m curious about what happens next. Aren’t you? So come join a panel discussion in celebration of my book launch. 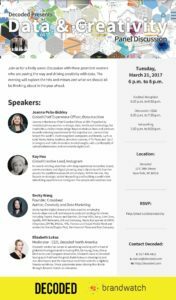 There’s a lot going on in the field of marketing, services, and media that are being transformed by the PROCESS of combining data and marketing and I’d love for you to join us in a discussion with Joanna (Thinxmachine, formerly of IBM), Kay (Instagram), Liz (DECODED, who are the kind hosts for the event), and myself in a happy hour evening talking this through. Its also an excuse to say hello. Please do if you’re in NYC.